The clinical evaluation of solid tumors typically includes needle biopsies, which can provide diagnostic (benign vs. cancer) and molecular information (targetable mutations, drug resistance, etc). This procedure has several diagnostic limitations, most notably, the potential to miss the mutations only millimeters away. In response to these limitations, the concept of “liquid biopsy” has emerged in recent years: the detection of nucleic acid cancer biomarkers, such as tumor-derived microRNAs (miRNAs) and circulating tumor DNA (ctDNA). These biomarkers have shown high diagnostic value and could guide the selection of appropriate targeted therapies. However, the abundance of these biomarker classes in the circulation is often too low to be detectable even with the most sensitive techniques because of their low levels of release from the tumor. How can we make tumor cells release these biomarkers into the blood? The most straightforward way would be to puncture the cell membrane so that its content is released. One technology that allows for just that is high intensity focused ultrasound (HIFU). HIFU uses powerful, controlled ultrasound waves that are focused inside human body to ablate the targeted tissue at the focus without affecting the surrounding organs. Alternatively, if HIFU waves are sent in short, infrequent but powerful bursts, they cause mechanical disruption of tissue at the focus without any thermal effects. The disruption is achieved by small gas bubbles in tissue that appear, grow and collapse in response to the ultrasound wave– a phenomenon known as cavitation. Depending on the pulsing protocol employed, the outcome can range from small holes in cell membranes and capillaries to complete liquefaction of a small region of tumor. Using this technology, we seek to release biomarkers from tumor cells into the circulation in the effort to detect them using a blood test and avoiding biopsy. Figure caption: Experimental setup and the basic concept of “ultrasound-aided liquid biopsy”. 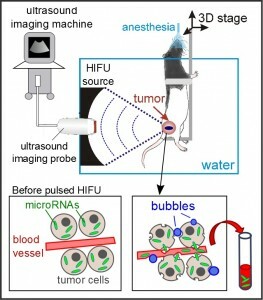 Pulsed high intensity focused ultrasound (HIFU) waves create, grow and collapse bubbles in tissue, which leads to puncturing of cell membranes and capillary walls. Cancer-derived microRNAs are thus released from the cells into the circulation and can be detected in a blood sample. 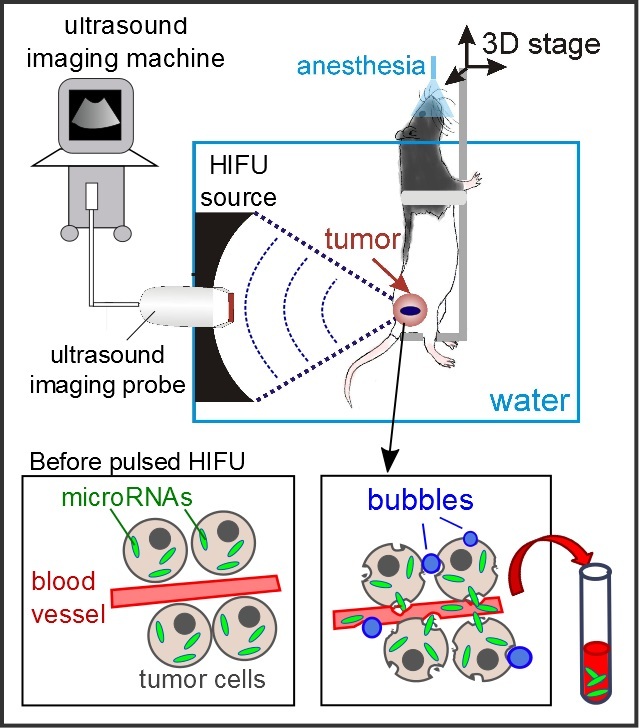 To test this approach, we applied pulsed HIFU exposures to prostate cancer tumors implanted under the skin of laboratory rats, as illustrated in the image above. For image guidance and targeting we used conventional ultrasound imaging. Blood samples were collected immediately before and at periodic intervals after HIFU treatment and were tested for the presence of microRNAs that are associated with rat prostate cancer. The levels of these miRNAs were elevated up to 12-fold within minutes after the ultrasound procedure, and then declined over the course of several hours. The effects on tissue were evaluated in the resected tumors, and we found only micron-sized areas of hemorrhage scattered through otherwise intact tissue, suggesting damage to small capillaries. These data provided the proof of principle for the approach that we termed “ultrasound-aided liquid biopsy”. We are now working on identifying other classes of clinically valuable biomarkers, most notably tumor-derived DNA, that could be amplified using this methodology.